Labor Day weekend is more than a holiday in the Ozark woods. 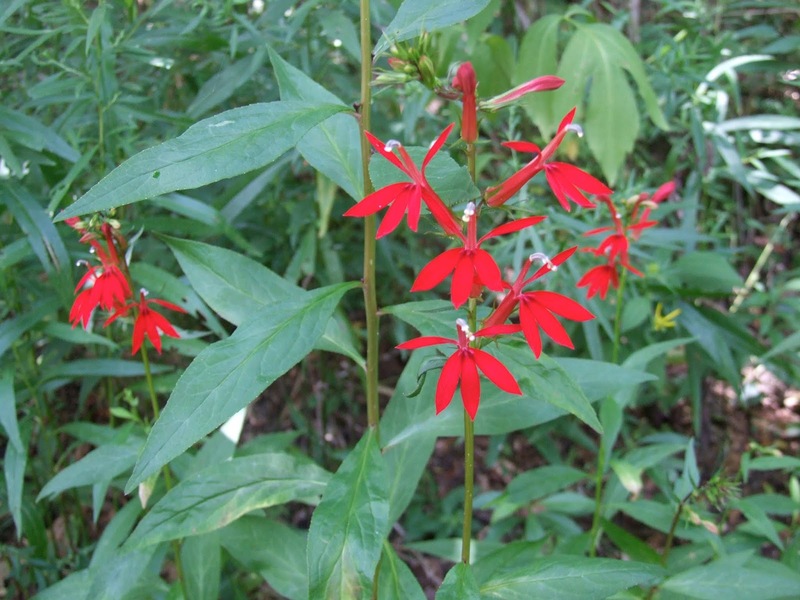 We see a number of old friends appear to mark the final days of summer, such as the cardinal flowers along the creek. 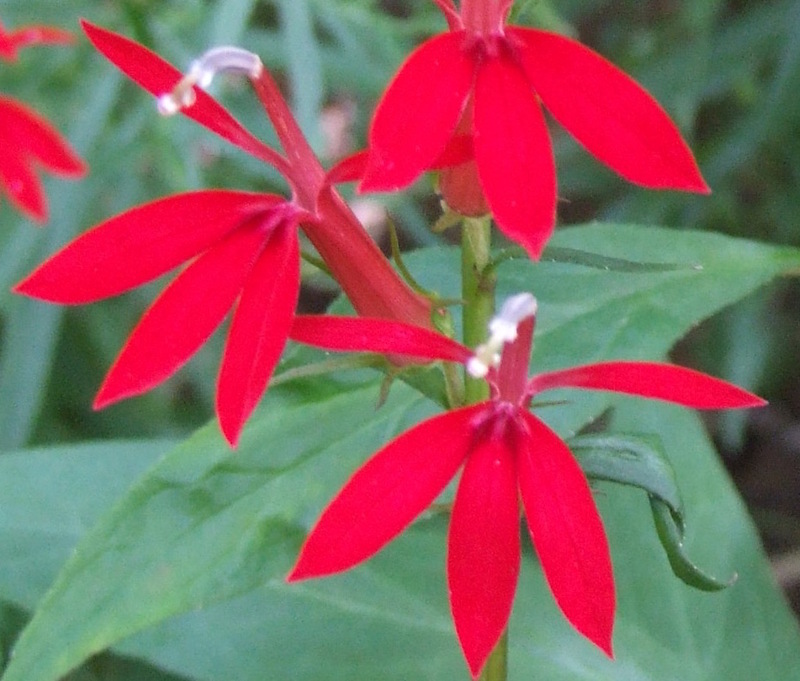 Lobelia cardinalis was described in 1629 by Englishman John Parkinson. He stated, "it groweth neere the river of Canada, where the French plantation in America is seated." 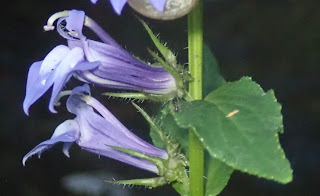 The French and English wrote extensively about it for 200 years and it soon became common in cultivation throughout Europe, especially in botanical gardens, and is mentioned in most of the earliest works on American plants. 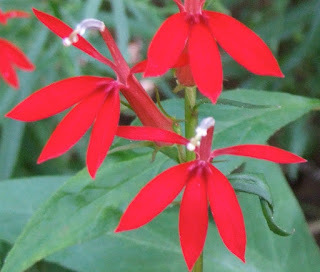 Lobelia spp. in general like their feet wet and are found along the edges of the creek and its moist drainages. Its appearance is so striking that even I recognize it immediately. It has a short lifespan and gets cranky and dies if it isn't kept moist. Because of its short lifespan and the toxic white latex in the foliage, its doesn't have many wildlife associations and lives its brief life under the radar of insects and herbivores. 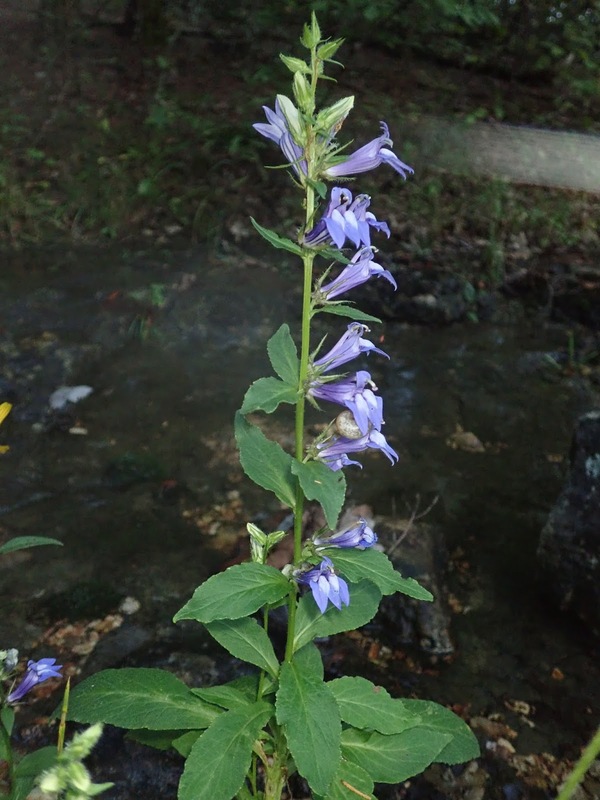 Much less common along Bull Creek is the blue lobelia, Lobelia syphilitica. Its delicate blue flowers appear on one or two isolated plants from year to year. It too contains several toxic alkaloids and has few significant wildlife associations. As you may have guessed, it has a medical history of some repute. 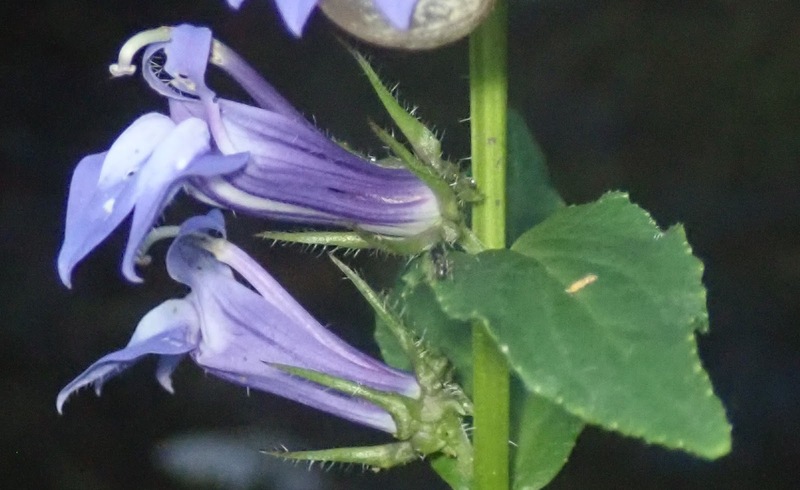 It was first mentioned by Lobelius in 1591 who was cultivating it in France. Sir William Johnson heard of the reputation of Lobelia syphilitica among the Indians for the cure of syphilis, and on his return wrote an account which was published in Latin. It took off all over Europe like penicillin did in the 1940's but without being effective. 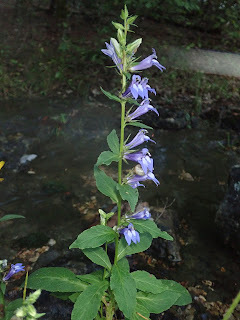 The delicate blue flowers are similar in shape to the cardinal flower. I would repeat this description of them in Illinois Wildflowers but it is all Greek to me.